I’m thinking about kids. My own specifically. No, I’m not pregnant (nor is anyone I know in a biblical sense) but it’s come up recently and it’s something on my mind. I’m thinking about how we, as parents, share our passions with kids. I wrote about it recently for David Magazine and how I thought it was missing from modern society. But now, as I’m thinking of kids and my next generation, I wonder how to share these things which I am passionate about. Growing up, I did my own thing. My parents certainly supported me in anything I wanted to do, and, in the best compliment I can give, they encouraged me to fail. I was involved in theatre, I loved movies and reading, I collected comic books and rode my bike all over town. But in all that, very little of it came from them. Possibly my love for technology came from my dad, as he was a proponent of getting the latest gadgets as they came off the assembly line, but even there, I learned how they worked, took classes in their repair and maintenance, with him at times, but even that was our learning together, not me leaning from him. Maybe my appreciation for show tunes, since we certainly had a number of broadway soundtrack albums around the house, but there beyond a few when I was younger, was there ever a “let’s talk about this show or that” evening. There was no “Sunday show tunes time” around the house. Even music was more of an osmosis, this is the cassette we listen to in the car so this is the music I learned about (My love of folk music can certainly be traced to listening to the Kingston Trio). What I don’t remember, though, is ever just sitting down with the folks because they said “I want you to listen to this because I love it and want to share it with you.” Which isn’t to say it never happened, I just don’t remember it. And this isn’t to say I had anything but a pretty great childhood, I did. I think times are different and I’m a different person than my parents are. I’m passionate about a number of things, like music and movies and science fiction and Ducks ice hockey and I want to share those things with my future children. I do it now with my girlfriend. We come from different times and different cultures and we have spent entire evenings going through digital record collections, jumping from song to song and telling stories about each one because I want to share them with her. I want her to understand my past through stories so I can share references with her. And with the kids, I want them to see Star Wars and even if they don’t like it (I solemnly swear not to give them up for adoption if that happens) I want to share it with them in the best possible way. I want them to know Han shot first. Which is the entire point of this post, really. 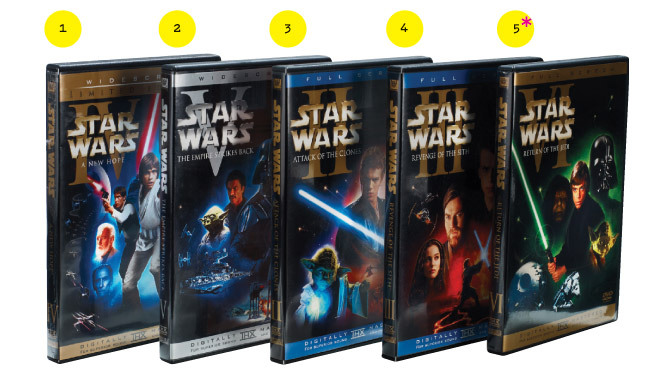 I just want a place to remember the Machete Order of watching the first 6 films (because, let’s face it, by the time my kids would be ready to watch anything, Episodes 7, 8, 9 and probably 10-15 inclusive will have been released). 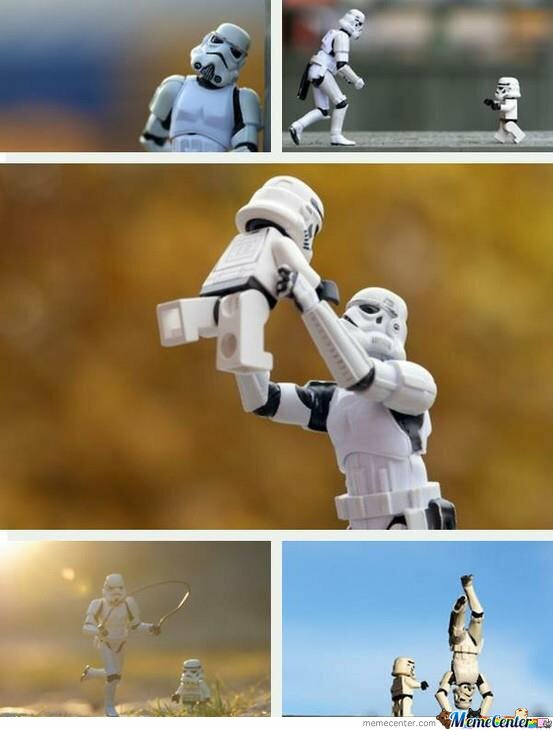 I’m sure as time goes on, and theoretical kids become real ones, I’ll have more to say on this topic, but until then… May the force be with you. The Machete Order is a must. Now, if only I could find the original releases of the first three filmed in the series — without the digital futzing. The special edition DVDs I bought include a second disk with the original versions. Ain’t giving those up for anything! We just recently watched the Phantom Edit of Episode I-III and I have to say, as a single film it was rather well done. It’s weird, you’d think I’d have had my Kaylee watch Star Wars before, and she has, but it didn’t do that much for her. She actually knows Star Wars more through Clone Wars and Rebels. The cool thing is though, she’s picked up through my love of nerdom, a love of a lot of really cool nerdy things. For example, as I type this she’s reading the comic book of “Home” which I bought for her this afternoon (my comics are on the couch – Fight Club 2 and Rick and Morty). Her favorite TV shows currently are Rocky and Bullwinkle, Power Rangers, Gatchaman, Speed Racer and Sailor Moon. She sits and watches you tube toy videos. Just like me. Very nice. She’s what…7 now? 8? I certainly figure there’s a bit of absorption but then you guys also have a bit of the outdoorsy stuff you share (this isn’t just about geekery, but the general idea of passing along passions so when the kid is older there’s that “I used to do this with my dad” warm and fuzzy memory.